The surroundings and finessed service set the stage for an elegant meal you’ll long remember. 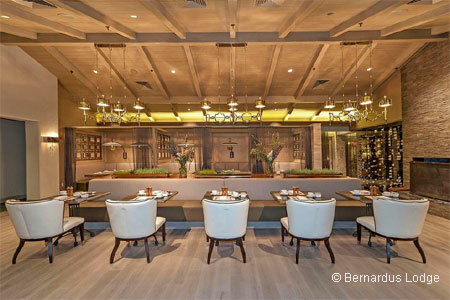 : Visit the remodeled Bernardus Lodge & Spa, where part of chef Cal Stamenov’s vegetable garden surrounds a patio with fire pits and heaters. The interior is sleek, silver and elegant, but not stuffy. Dishes combine textures and contrasting flavors for a satisfying banquet of choices, while understated service is efficient and just friendly enough. The sommelier’s wine suggestions demonstrate skill and expertise with the menu. We recommend the mushroom bisque that’s both earthy and ethereal with a whiff of truffle. Seared foie gras, with a sweet-tart poached pear for contrast, is just the right bite of luxury. Abalone is fork-tender, and comes perched on creamy, slightly smoky spaghetti carbonara topped with a quail egg. Duck rillettes on toasted baguette rounds boast bold taste, and pair beautifully with mildly spicy baby arugula salad. Even the simple apple and fig salad with sharp, three-year-aged Wisconsin cheddar is elevated. In the next act, relish the sweet day boat scallops. Rabbit includes a juicy grilled loin and a confit leg and thigh on buttery mashed potatoes with fresh English peas and braised carrots for a pop of sweetness. For dessert, go with the warm apple spice cake with house-made ice cream. It’s redolent of autumn and Norman Rockwell.